I sometimes play a game with Nate: would you love me if I lost all my hair? would you love me if I couldn't walk anymore? would you love me if I grew a hunchback? 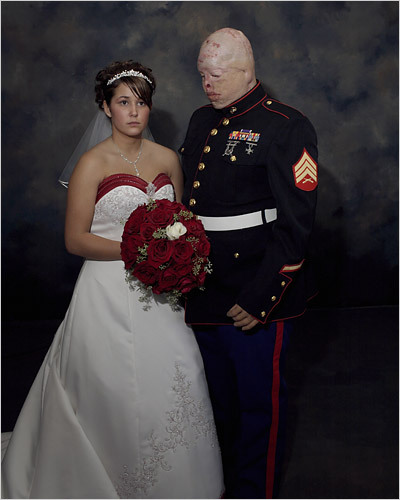 Here is a photo that answers a more awful question: would you love me if I was wounded in the war by being trapped in a burning vehicle that melted my face off? And the answer for Renee Kline and Ty Ziegler is yes. Whenever I hear Mr. Bush speak about the "progress" in Iraq, or about our "duty" to build democracy, I always think of how far he is from the situation, how he never pays attention to bad news. He has never been in a war. He dresses in flight suits, parades around and pretends he knows about war. The people in the picture above, taken by Nina Berman as part of a series on wounded veterans from Iraq, know about war. They are bravely continuing their lives, scarred physically and mentally. I admire their courage. And I hate those who have put them in this place. Time for me to be the insensitive jerk you know me to be. Is that a wedding picture? He looks good. He has gone through some bad stuff, but is smiling and in love. She looks like she has a shotgun to her back. Is this supposed to show the unconditional love you speak of? Perhaps you chose the wrong picture? 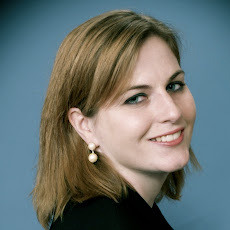 Please, there must be one with her smiling for your blog to make sense.